The only definitive way to tell if a child’s ear is infected is to see an experienced doctor. Given time, most parents are able to learn their children’s personality and how they behave when sick verses teething. Each individual’s experience with pain is unique and it is therefore impossible to give definitive guidelines. 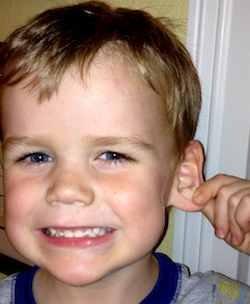 In pediatrics, we often see children between 6 to 9 months whose parents report “ear tugging”. Fortunately most of these children do not have ear infections, but have simply have found their ears. Usually ear infections develop after several days of illness. Ear infections tend develop on top of viral infections or allergies. Viral infections create an environment ideal for the growth of the bacteria that cause ear infections. The typical story of a child with an ear infection begins with a viral illness. After a couple days of fever, runny nose and cough the child seems to be getting better. Then suddenly, he develops a higher fever, increased fussiness and ear pain. When our children experienced teething, their pain pattern was different than that of ear infections. Usually teething causes 2 or 3 days of fussiness followed by a week of acting normal followed by 2 or 3 more days of fussiness. Most children get their first tooth at 7 to 8 months old. Parents often report symptoms (drooling and intermittent fussiness) of teething beginning at 3 to 4 months of age. The 1st set of molars seems to cause the most discomfort. These usually appear around 15 months old. If you are concerned your child could have an ear infection, take them to their doctor.